This rather sad Zither Banjo tugged at my heart-strings with a song of longing for repair. I bought it on a whim hating to see what seemed a nice instrument in such a sorry state. I had the idea it could be fixed and hoped (for no rational reason) that it was not going to be too expensive to fix. Looking it over the neck looked good, the hardware seemed fine, the vellum was in good condition. However, the fingerboard was both split down the middle and also shrunk. The frets were sticking out 1 or 2mm beyond the end of the fingerboard, on both sides. The back was lifting off and the peghead facing was split. So, I bought it a price that I would not regret if the banjo turned out to be too expensive to fix, which as you will see below, it wasn’t. Once I had it home I researched just what it was. I had never heard of a “zither banjo” before, but that is what it is. They were primarily a British instrument very popular in the late 1800s and into the early to mid 1900s. The distinguishing features are that the fifth string does not have the side peg found on other banjos but instead enters a tunnel and emerges near one of the tuning pegs on the head of the instrument. The head is almost always fitted with six pegs but they only use 5 strings – one tuning peg does nothing other than bring symmetry. It is said that they are guitar pegheads that were used for banjos too as a matter of economy, but I would think there was more to it than that, at least after the first few years. Zither banjos also have a closed back and smaller head than most other kinds of banjos. This instrument has no clear sign of a manufacturer though it is stamped with “The Henderson” on the base of the neck. It is not clear if the The Henderson is a maker, a model, or something else. There was a Henderson maker of banjos in Brixton but I could find no pictures of a banjo definitively made by Henderson, so can’t be sure if this is one. I did find another one (link) that is very similar also stamped with “The Henderson”. And I wrote to banjo historian who did not recognise the maker but suggested “it has a look of a Dallas instrument and it is well know that Dallas and other major players made instruments for Music Shops and Teachers to sell as ‘own brand’ “. For resources to do with zither banjos check out this site (link). The entry in a database of banjos for Walter Henderson Brixton maker at this link and for Dallas can be found here. Overall it seemed the instrument was not something special worthy of careful restoration and this influenced my decision to change it up quite a bit. I don’t play any instruments, but thought it would make a good Christmas present for my musician son. To keep the costs down I thought replacing the fingerboard with a fretless board would be a good start, and frets could always be added later if needed. I like the sound of fretless banjos, they have an unusual and quite soft tone and I thought my son would like the sound. Since he plays a variety of instruments including fretless basses I figured he could handle a fretless banjo just fine. I knew who I wanted to do the work. Zak Stolk is a luthier in the Cowichan Valley a 90 minute drive north. He had done a nice job of fixing my son’s double bass, at a very reasonable price. One of the things that Zak does is very fine wood burning, though I have not see it on his instruments. I suggested if he used a light coloured wood he could decorate the fingerboard with wood burning. In discussions when I went to visit him, and after when he had the instrument apart, we decided to also do the peghead facing that way, and to replace the back and decorate it too. The fingerboard and peghead are a hard maple from the eastern seaboard while the back is a local big leaf maple. Zak did a beautiful job of bringing the instrument back to life for a price I could afford. 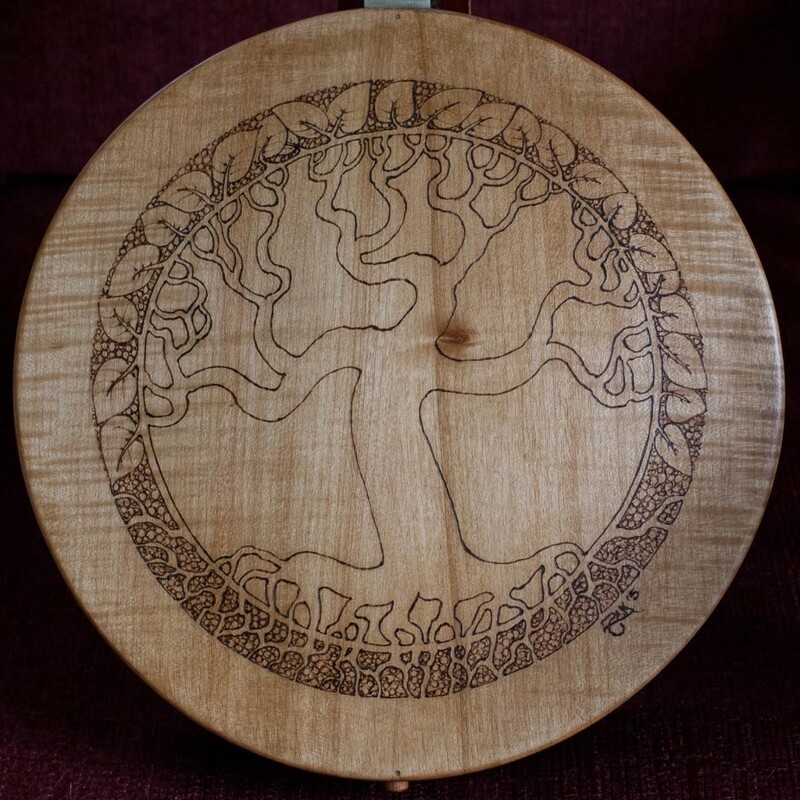 I chose a tree of life or Yggdrasil type design, but left it up to him to make something that worked, and that he enjoyed doing. Clearly he enjoyed the decorating. My son really likes the tone and is impressed with the appearance too. One day I expect to hear it on a recording or see it on stage, but he says he needs to practice it quite a bit before he can play with other instruments. It was gratifying to get this banjo back into playable shape. And with nylon strings, a small diameter drum head and solid back, it has a quite soft and pleasant sound. It most definitely is no longer the best kind of kindling to light a pyre for bagpipes. Click/tap on any image to open the gallery for larger views and navigate with the arrows. Canon 5Dii, EF 50/1.4, various exposures, see gallery for EXIF data. Great work! But what does it sound like? Wonderful story plus research and creative restoration, Mr E. How wonderful that it will be played again. Hi Kate – it is very nice to hear it played. My son has fooled around on banjos a bit over the past few years but I think this instrument is quite a different experience. He seemed to like it and I don’t think he was just putting on a polite-gift-recipient-face. I’m sure he LOVED it! I think so. Just can be hard to tell sometimes. He might be playing it a lot for all I know. And if not, I am sure he will make use of it in the future. Hi skadhu – isn’t it? And it sounds good too! It was a lucky day when you saw that old banjo and were moved to buy it, and give it a new lease on life. If your son does play it in public one day, I hope there’ll be a video for us to enjoy. Hi Yvonne. It worked out well – very pleasing to be able to help old thing back to life. I too hope there will be a video or audio track to share one day. I am fond of all banjo music. Nice “restoration” I like the woodburning. and what a very nice thing to do for your son the musician. Thank you Sherry. It worked out very well, and fortunately plays well and sounds good on top of being a work of art.